The Smokies are a great place to celebrate the seasons and events. What better place to celebrate a wedding, birthday, or a family reunion, than right here in the Smokies? We’ve picked out several venues for you that complement various types of events. Margaritaville at The Island has a unique atmosphere for your bridal or wedding shower. You can feel like you’re having an island destination experience in the Smokies! Enjoy a welcoming and laid-back environment surrounded by natural wood and colors pulled from the tropics. You can schedule your party from their reservation page. Journey to the Biltmore Estate in Asheville, NC, and experience your wedding shower in the Champagne Cellar. There you’ll be surrounded by European features, warm candlelight, and an intimate setting for up to 30 guests. You’ll enjoy delicious food and drinks, and feel as though you’ve stepped back in time as the gray stone walls surround you. Request more information on their website. TopJump in Pigeon Forge is the first trampoline park to hit Sevier County. 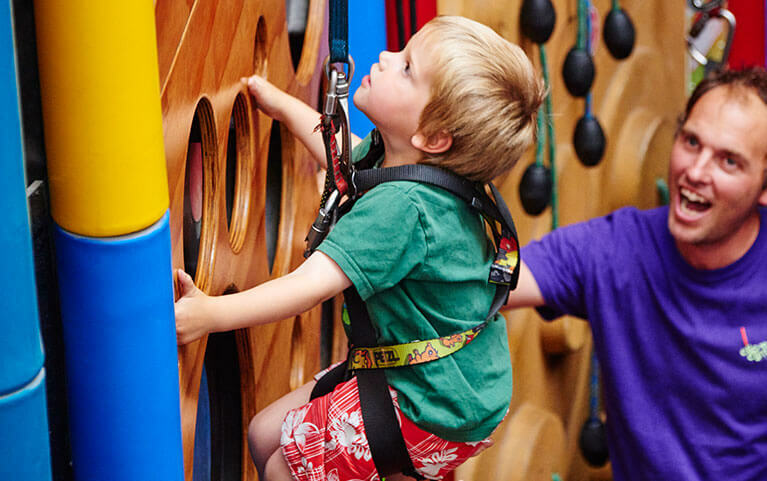 They have party packages that include jump time, climb time, or both. The packages include tableware, invites, and even pizza and soda in a party room or viewing area. Don’t worry about cleaning up the mess. Setup and cleanup are all taken care of by the TopJump staff. Book your party from their website. OnSight Rock Gym in Knoxville offers climbing walls for all ages and abilities. A birthday gift bag includes a t-shirt, carabiner keychain, and sticker. You can add on additional party favors and include pizza in your party package. You’ll have access to picnic tables, and the staff will set up and clean for you. Book your party from their website. What better place to have a party than at the Zoo? Zoo Knoxville has a unique party experience that includes a party room, private animal encounter, hats, drinks, and zoo admission for 20 guests ages four and up (under 4 are free). One of the smaller party options doesn’t include a dedicated venue or animal encounter but does include cupcakes, hats, juice, and admission. With the included table cover, you can pick the picnic spot you’d like for your party. Learn more about the Zoo Knoxville party offerings on their website. They also offer catering for other types of events. Christopher Place offers full house rentals that include a two-night stay for 20 guests in 10 rooms with baths. You’ll be welcomed with a BBQ dinner for your family, and a gourmet breakfast each morning. You can relax, or plan a trip to raft, zipline, or golf. You and your family members will enjoy private access to the tennis court, swimming pool, sauna, library pub, and game room. Your private chef will prepare a four-course dinner. Best of all, you’ll have an event coordinator help you take care of all the details. Learn more about this package from their website. Deer Ridge Mountain Resort is located in the Cobbly Nob community and is close to all the area attractions and destinations. They offer both condos and cabins. With more than 16 people in your group lodging stay, you get access to the Sun Deck or Pavilion area (cleanup, chair, and table rentals are extra). Discounts are available for groups, anywhere from 20-30% off. Every condo has a private balcony to view the Smoky Mountains. Learn more about the group rates from their website. Do you have any other great locations to host a party in the Smokies? Whether it be the perfect setting or an all-inclusive party with a planner included, we’d love to hear about it. Let us know in the comments section below. Zoo Knoxville is Wildly Fun!